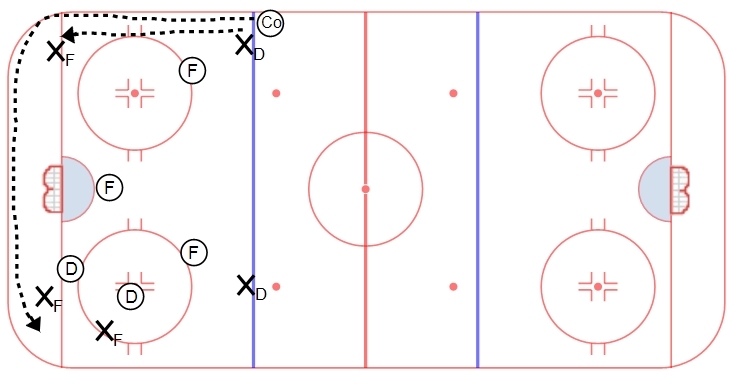 A half-ice situational practice drill. Can be done out of both ends or just one side, depending on numbers and teaching situations. The drill starts with two Fs (XF) facing the boards in the corner – two D (OD) are about 3 feet off of their backs. The remaining players (1 XF, 2 XD and 3 OF) are in defensive position in the zone. Coach rims a puck around the wall, the forwards have to stop it and then play 2v2 down low, attempting to attack the net and score. On a whistle, coach will pass the puck to the other XF waiting in the opposite corner – the defensive team has to quickly adjust and reset their coverage to this new situation/second puck. Now all players in zone are live and it is played out 5v5. This is a great situational drill to work on either dzone or ozone team play. Offensive players can work on puck protection, attacking the net, creating time and space through cause and effect, etc. Defensive players work on their ability to contain, using their sticks to influence the play, positional discipline, quickly changing sides, etc.